Die Versandadresse liegt innerhalb Deutschlands. Sie bezahlen per Kreditkarte oder per Vorkasse Bei Lieferung per Nachnahme ist die Lieferung auch versandkostenfrei. Es wird allerdings eine NachnahmegebÃ¼hr EUR 4,- zzgl. EUR 2,- RÃ¼ckfÃ¼hrungsentgelt (PostgebÃ¼hr) erhoben. das gilt dann fÃ¼r die gesamte Sendung! Bestellen Sie also doch einfach noch weitere Produkte dazu, das spart! Sollten Sie nachtrÃ¤glich von Ihrem RÃ¼ckgaberecht Gebrauch machen, dann wÃ¤ren dadurch im Nachhinein die anderen Produkte dieser Sendung nicht mehr versandkostenfrei, und wir mÃ¼ssen die Versandkosten durch Verrechnung bei der Gutschrift des zurÃ¼ckgesandten Artikels leider nachbelasten. Ansonsten gelten die ganz normalen Action Sports-Bedingungen. Conditions: Timely shipping is only available for appropriately labeled items (in stock). If there are other (not appropriately marked) items in the shopping cart, the order will be sent as soon as all items (according to the delivery instructions) are available. A partial delivery is not made. Excluded are public holidays in NRW, as well as the 24.12. (Christmas Eve) and the 31.12. (New Year's Eve). 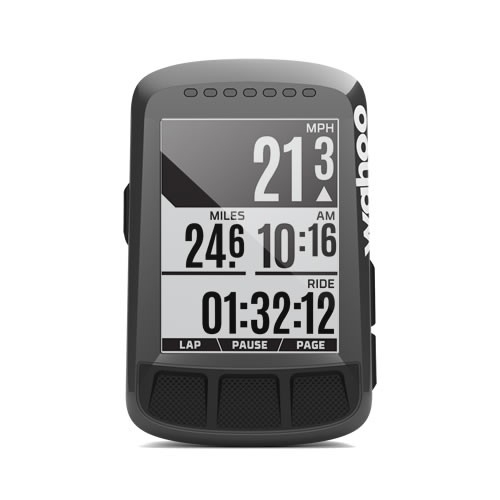 Product information "Wahoo Elemnt Bolt GPS Bike Computer"
The simplest to use and most aerodynamic bike computer on the market. ELEMNT BOLT is the first, fully aerodynamic GPS bike computer! Its patent pending design creates an integrated system of computer and mount which results in a CFD (Computational Fluid Design) tested, highly aerodynamic system built to be on the front of your bicycle. Equipped with Bluetooth Smart and ANT+ dual-band technology, ELEMNT BOLT pairs seamlessly with all of your cycling sensors. It works with our free ELEMNT companion app which allows you to set up your data fields, customize profiles, track performance, and share ride data effortlessly - no more confusing menus! Plus, programmable LED QuickLook Indicators provide a quick way to see if you're on pace with important performance metrics like speed, heart rate, and power. Designed for performance and engineered for simplicity - the ELEMNT BOLT GPS Bike Computer helps make every second count. Your Smartphone is necessary for setup and to have phone, email, and alert features. The ELEMNT is the most integrated GPS bike computer on the market with a full list of compatible hardware and smartphone apps. Related links to "Wahoo Elemnt Bolt GPS Bike Computer"
Customer evaluation for "Wahoo Elemnt Bolt GPS Bike Computer"
SKS Shockblade MTB dirtboar Dark 29'' u. 27,5+"